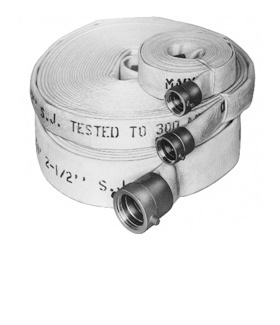 Moonflex Rack & Reel Hose has a 100% polyester jacket with extruded rubber lining. 500 pound test pressure. Recommended for interior rack and reel installations and for replacement of linen hose. Can be installed on racks now holding linen hose. Available in 50, 75, and 100 foot lengths. Factory Mutual approved and Underwriters Laboratories label available.